This script adds the ability to send the same message to multiple recipients in the same universe – directly from the Send Message window. 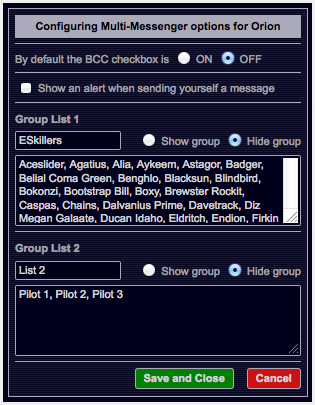 The standard Send Message window is reflowed from the initial screen to incorporate a larger area for you to type multiple pilot names (these can be comma or semi-colon delimited) as well as a checkbox to control whether or not the recipients can see who else was included in the message (using the familiar BCC description). A link is added to the bottom right of the window that, when clicked, shows a Settings Panel of configuarable options to the right of the main message options. These settings are independent for each universe, allowing you to have different settings between universes. 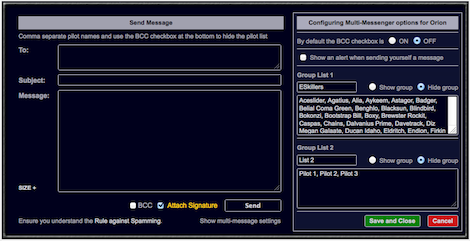 You can choose the default setting for the BCC checkbox when starting a new message. This does not prevent you from changing the BCC checkbox setting on a message by message basis. You cannot send yourself a message, but if you do include your name in a list of recipients, you can control whether or not to show an alert telling you that you cannot send to yourself. By default no alert will be presented. You can also create up to two groups of pilots that appear as links and allow you to replace the recipients of a message with a predetermined list using a single click. By default none of these groups are displayed. This script is closely based on Ivar’s original Multi Message script (sadly no longer available from his website (http://pardus.rukh.de/). 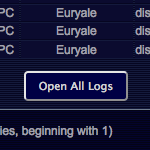 This script adds a button at the bottom of the Combat Logs page to open up all logs on the current page – each in a new tab. This is an ideal companion script for use when you have an automated combat log uploader script that sends the combat log to an Infocenter when it is opened. This script is closely based on Tsunami’s original script. Sounds an audio alert every 60 seconds when an ACS message is pending. This will continue to sound until the Alliance Command Station log is opened and the icon disappears from the message frame. Play a warning sound 1 minute before Lucidi Squad and Z Series NPCs are scheduled to move and then another sound at the actual time they can move. This script uses the time on your computer to determine when each of the sounds play – so be sure your computer time is synchronised to the correct time. Once installed, refresh the screen to start the timer running. While you have the option to display the individual tiles in the navigation display at several sizes (64px, 96px and 128px depending on the image pack you use), there may be times where you want to use a different size. The image shown here is a full 9×9 navigation display with the tile size set to 24px. It has been reproduced here without having been resized with an image editor. Maybe you are using a small screen that prevents you from seeing all the entire navigation screen without scrolling. This script changes the width and height of the tiles to allow for finer adjustment of the tile size. By default it will resize the navigation tiles to 48px by 48px. If you wish to edit the userscript to show a different tile size, use a text editor and follow the simple instructions contained in the userscript itself. Note – this script will work with partial refresh enabled or disabled. 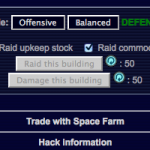 If you are a trader, the last thing you will want to do is attack or raid one of the buildings in the economy you are working in. With the placement of the Raid and Damage buttons, this can happen from time to time. This script disables these buttons – so even if you do click them by accident, they will have no effect. Because there is no mechanism to disable this script for a single universe, if you are attacking buildings elsewhere you will need to disable it until you are finished being destructive. Plays a sound when the message notification icon is displayed in the message frame. The sound will continue to play each time the message frame refreshes and will only stop when the message notification icon is no longer present (after the message has been read). This script is based closely on the Combat Notifier script from Takius Stargazer. Repeatedly plays a sound when a combat notification icon is displayed in the message frame. The sound will only stop when the combat notification icon is no longer present (after the combat log has been read). Show a small map of the current sector in various locations on the navigation screen. Your current position is updated on the map as you move around. 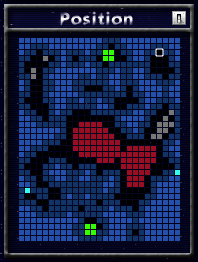 As you place your mouse over any tile, the coordinates of the tile are shown at the top right of the Mini Mapper display. 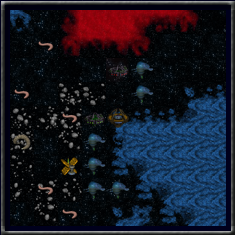 When you place your mouse over wormhole tiles, a tooltip showing the destination sector is displayed. In the case of multiple wormholes in the same sector going to the same destination sector, the coordinates of the destination sector are also shown in the tooltip. 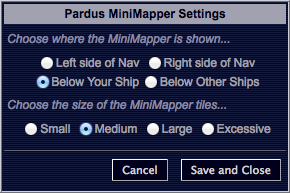 Click the Preferences icon to adjust the location where the Mini Mapper is displayed and the size of the Mini Mapper tiles. No data about your location is transmitted elsewhere – and all required data for the sector maps is included in the initial download of the userscript. This script allows you to switch between Offensive, Balanced and Defensive combat modes without having to leave the navigation screen. Buttons are displayed in the Status box on the main navigation screen and kept in sync regardless of whether you change modes in PvP, Buildings or NPC combat. Once installed, visit the Advanced Skill Management page (via the Overview tab) to determine which buttons to show based on whether you have learned the appropriate skill.